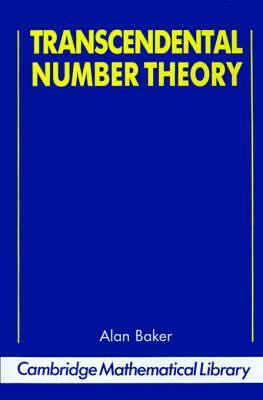 First published in 1975, this classic book gives a systematic account of transcendental number theory, that is those numbers which cannot be expressed as the roots of algebraic equations having rational coefficients. Their study has developed into a fertile and extensive theory enriching many branches of pure mathematics. Expositions are presented of theories relating to linear forms in the logarithms of algebraic numbers, of Schmidt's generalisation of the Thue-Siegel-Roth theorem, of Shidlovsky's work on Siegel's |E|-functions and of Sprindzuk's solution to the Mahler conjecture. The volume was revised in 1979: however Professor Baker has taken this further opportunity to update the book including new advances in the theory and many new references. Preface; 1. The origins; 2. Linear forms in logarithms; 3. Lower bounds for linear forms; 4. Diophantine equations; 5. Class numbers of imaginary quadratic fields; 6. Elliptic functions; 7. Rational approximations to algebraic numbers; 8. Mahler's classification; 9. Metrical theory; 10. The exponential function; 11. The Siegel-Shidlovsky theorems; 12. Algebraic independence; Bibliography; Original papers; Further publications; New developments; Index.